There's nothing weird about collecting things - in fact, most people do it. Whether it's DVDs, video games, stamps, vintage lunchboxes or even rare Star Wars figures, there's something attractive about the lore of the hunt, finding that oh-so-rare item. In addition to that undeniable draw, there's also the space those coveted objects ultimately occupy - how you choose to display those things that you collect. As that space is filled, it brings a collection to life. Each object has a story attached to it - how you acquired it, where you were when you found it. Each piece of the collection acts like a thumbtack on the cork board of your life, pinning an object to a moment and creating a vivid, pointed memory. If you've ever felt that way, you understand something about the heart of an otaku and how they live. Otaku collecting is not limited to just anime-related merchandise. There are many different types of otaku, such as "Pasocon-ota" (computer geeks) and "Gunji-ota" (fans of military themed items). 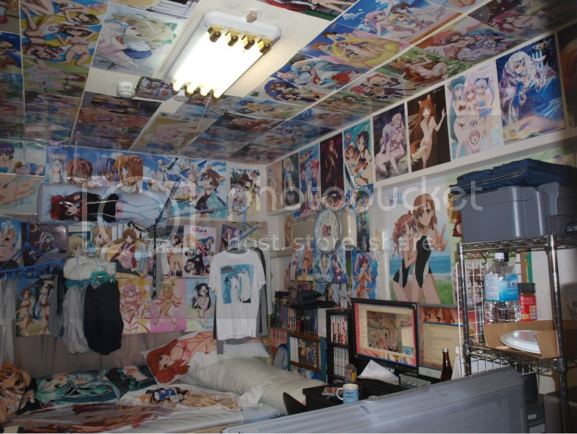 Otaku even compete to have the most impressive rooms. Japanese culture guru Danny Choo challenged the readers of his website to take photos of their rooms and submit them online, which were eventually compiled into a series of best-selling books called "Otacool." These books give the reader the ability to peek through the keyhole into a world that is equal parts foreign, unusual and absolutely fascinating. "Otaku rooms are some of the most interesting rooms I get to see – filled to the brim with anime and game merchandise," Choo says. "Just like how mum likes to display and enjoy looking at crockery around the house, otaku love to be close to and admire physical representations of their favorite characters." This method of collecting is merely a highly stylized version of any other collector's methods, but it holds a key in that it communicates a tremendous amount of information from one otaku to another, sketching a vast illustration of their specific interests and drilling down to subgenres of subgenres. In this form of collecting, a deeply personal form of expression is born. The intimacy that this kind of collecting creates threads of connection between people with similar interests. At a glance, one can't help but wonder if there is some level of competition involved, as one of the things about the otaku bedroom that really jumps out at people is the sheer quantity of collectibles present. The word otaku, as well as their activities and ways of life, generates both positive and negative connotations. Some view the collecting as obsessive and the interest in anime characters as perverse. What about the negative stipulations associated with this type of collecting, such as the viewpoint that their hobbies are too extreme? Galbraith says that just because otaku are more specific in what they consume, and tend to know more about and get more involved with it, doesn’t mean that they are losers. "Though it is true that some people might have hobbies that keep them at home, I don’t think interest in media or commodities means that you aren’t interested in people. People who consider otaku losers without ever meeting or talking to those who identify or are identified that way are probably just reacting to negative stereotypes. Or they are discriminating against hobbies that they do not share or understand." Certainly there is something intimidating about a level of collecting that seems obsessive - especially if it's paired with isolation. However, one of the most remarkable things about otaku collecting is that is does allow bonding between fans on levels of interest so niche that it would be difficult to have the same connections with strangers. By bonding over favorite shows, manga, fan art and more, otaku actually move further away from isolation. What once may have made them feel separated now gives them the chance to feel less separated then ever. Galbraith says that in his observation, the otaku's collecting habits are less about social status and more about a way of life. In the otaku mindset, objects didn't matter as much as the process by which they were acquired. "What I learned while talking to people about their spaces was that those who were truly collectors didn’t talk so much about social status. It was more about fulfilling a need. A personal need to see or have something, and, in his case, to share it. It leads us to think about the socioeconomic conditions that allow for the development of otaku spaces in Japan and beyond." It's actually a nice and helpful piece of info. I'm glad that you simply shared this helpful information with us. Please stay us informed like this. Thanks for sharing. Looks to me like your tinfoil is not very strong. You need to sew your fingers and toes together, lest the One World Government infiltrate your mind though the gaps. Seal all of your orifices now! Gouge out your eyes. Then you will see the light. Really. No, really. Trust me. I know what I am talking about. They are coming for you tomorrow at noon. What time zone are you in? Wow, I see the freak show is out in force on the message boards this weekend. Some of the posters here are waaay more disturbing than any of the otaku hoarders in the article. When I was in middle school, I SO wanted to have a room of my own to decorate just like that. I just went bright green with envy when I saw pictures of other otaku with entire bookcases of manga & comics, posters on the wall, gashapon (figurines) everywhere. That was years ago & I no longer want a space anywhere near that cluttered, but it's nice to see people are still having fun geeking out. 🙂 Let the Gundam force be with you! IF THEY BRAINWASH YOU WITH LIES ON HOW ELECTING TERRORIST OBAMA WOULD HELP TEA PARTY(there is already over one hundred million of so called minorities in US alone while you are everything, but treated as humans), PLEASE ASK YOURSELF WHAT ARE YOUR CHANCES OF SURVIVAL ONCE OBAMA IS AGAIN SELF-ELECTED(see video 77) & SINCE NEW LAW IS TAKING GUNS FROM YOU ALREADY TODAY(stop the violent world of psychiatry or lies – NOW OR DIE) !!! hear hear! or is it here here? it's actually hare hare! thnaks for letting me know about LS. it is indeed quite ramble-oscious but in the way that grows on you. i've got a thing for Hirano so i've already got one bias there Konata reminds me of a friend at school (who acts/resembles her minus the gaming) which is actually pretty cool. Lucky Star just work it, and work it, and darling darling ! oops. Please make sure to leave some tinfoil for the rest of us when you're done making your hats. I see immense pain for these demon possessed souls after death. Why does Mr. Obama not release his long-form birth cetafiictre? This would prove his natural born citizenship. I understand he has spent over a millon dollar to hide it from the public. It will just cost a few dollars to take a copy and show it to the press. And you will answer the question, "Why did you judge and create human discord during your time on my glorious planet?" It's just collection, not worship. VAST difference.